This time, I decided to clean up my gallery and set it back to zero, because last time I opened my gallery on a board, I had to split it in 3 posts to be sure to have place when I update. I will gradually add new pics. My first vector creation with Inkscape. 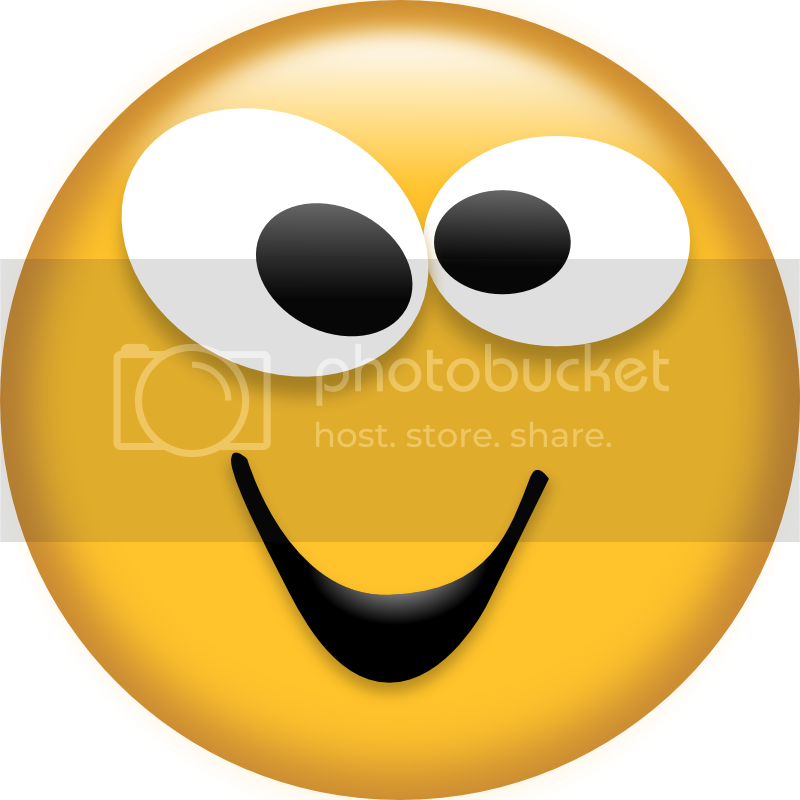 I reproduced Forumotion's old smiley face. I kept the SVG archive so I still can make either a very small or a XXL version of it without quality loss. Yes ^^ As soon as SupportActif has been deleted, the style didn't have this "exclusivity" anymore, so I decided to recycle this style for self-service. About the French board... no comment -_- I'm going to delete my two accounts as soon as my messages are deleted. But I will keep my account on the English one. About the previous ID, this moving was necessary. I couldn't see myself continue on a FM with FM-only services if I leave the FM supports. And whenever I get a big sanction or not on a FM support (because of flamewars), I don't have the risks of getting my board deleted if my board is non-FM, and most of all, I can restore it anytime if something bad happens (hack, etc. ), just like I did when Olympe got hacked by a crashers team. Talking about this, I will do another backup, even if I did one last Sunday night. Tes thèmes PHPBB2 sont réellement jolie ! 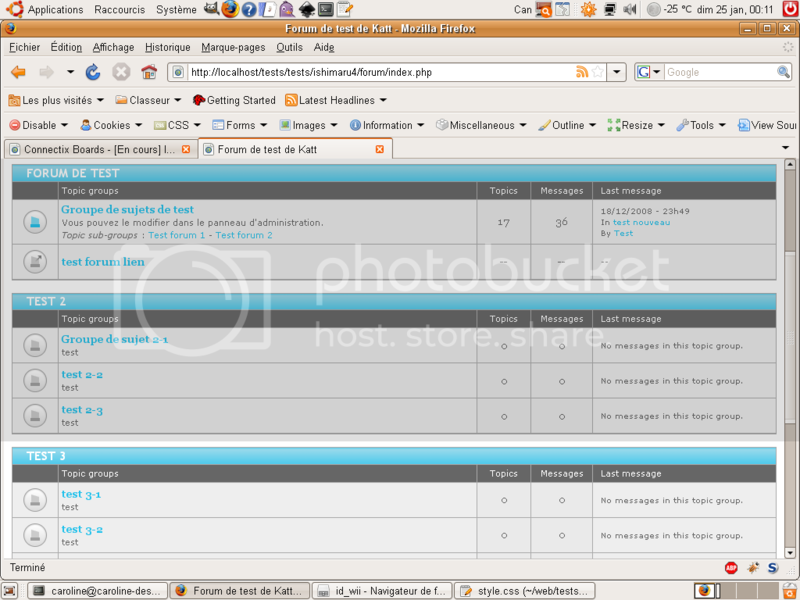 Your PHPBB2 skin are realy nice ! En plus, je les ai mis à jour dernièrement, avec la sortie de la version 2.0.23. J'ai également corrigé un oubli que j'avais fait dans modcp_body.tpl (les dimensions du dossier de topic). 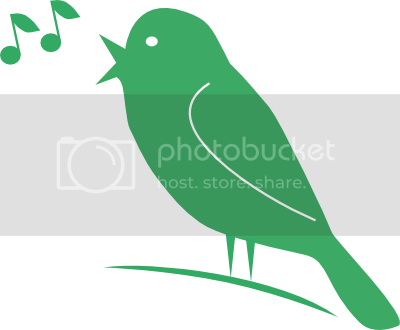 I first drew the bird on a sketchbook, then I scanned it so I can have guides to draw it with Inkscape. That's a very nice Logo Katt. I also began a ConnectixBoards skin. > Mikichou : I've got a formation on Projet-Gimp, there are many Gimp users who are skillful at sig techniques (smudge, c4d, render inlaying). You can find the link in the ad buttons list, at the bottom of the forum's page, between the SDZ and HOL ones. This is my first phpBB3 style. It's almost finished, there are a few details left before I can release it. I have to solve the template header issue (I had to use a dirty trick to hide the rounded corners. Since I'm currently under Ubuntu, I haven't tested under IE7 yet, I'll do it when I'll boot on XP. Unfortunately, at the moment that I wanted to post my link on phpBB-fr.com, the forum was under maintenance. For most icons (except the ubuntu logo I found on the net), I found them in my /usr/share/icons/ directory where all Ubuntu icons are located (there are both PNG and SVG files) on my PC. This time, I had to do a lot of SVG export into bitmap. EDIT : Style updated in order to correct a wrong template set attribution (strangely, it happened only on the online board, not on the local one). You should now see the two panels on top and bottom of pages. Not bad work for an old bird. Love the phpbb theme, great work! Il me reste quelques détails à finaliser avant de l'envoyer à la validation. 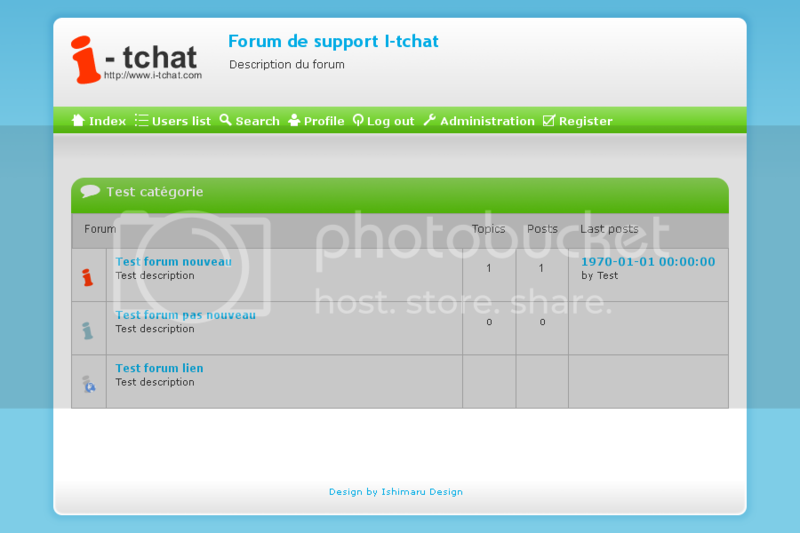 On a French FM directory board (lesforumsde.forumactif.com), Toto456, the admin, contacted me because the webmaster of I-tchat is about to change forum script (from ipb to punbb 1.3.x - both are non-FM) for his support forum and so, he wants a custom design for the new version. So, he talked about it with Toto456 who then thought about me and so, PM'd me to ask me if I'm interested in making a punbb 1.3.x design for this webmaster. Even if I had no experience in punbb, I knew I would learn quite fast since I have stronge knowledge in CSS2 (punbb is valid xhtml 1.0 strict). So, I installed punbb on my localhost and spent a whole night testing it and learning its CSS before I confirmed. Then, this continued by email between me and the webmaster and I'm now quite advanced in the design progress. 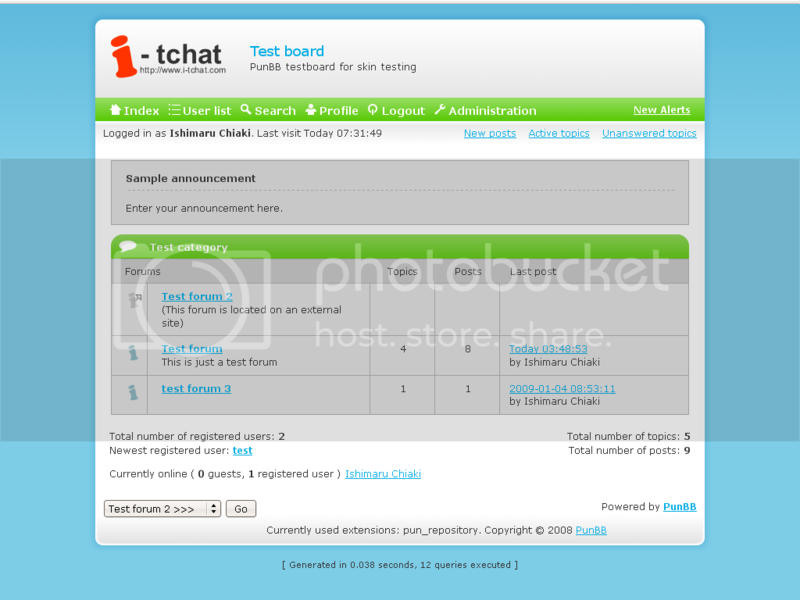 Note 2 : Only the i-tchat logo (provided by the webmaster) + its derivatives, and the small planet icon (taken from open clipart library) aren't mine. The rest is homemade, even the navigation icons - I used the paths and selections a lot to draw them. Note 3 : The table headers won't be as high as in the demo once CSS coded. Note 4 : The fonts are here only for demo purpose. They will be removed before I cut the design in pieces. Note 5 : I volontarily omitted some parts (texts between the menu and the forum index, stats box) in order to simplify the demo. I'm currently waiting for his reply to see if there is anything to modify before I code it in the CSS. I talked about the PunBB 1.3.x style I was working on for a request. I had just one very small detail to modify (the redirect forum icon). The rest was perfect for him. When there are new posts, the inner icon turns blue, and topics where the poster has participated are marked with a blue border. wow I like this one pretty much.